Cordoba is a mid-sized city of 350,000 inhabitants and the capital of the province of Cordoba, situated in the center of Andalucia in Spain. A great cultural reference point in Europe, this ancient city has been declared a World Heritage Site and contains a mixture of the diverse cultures that have settled it throughout history. Very few places in the world can boast of having been the capital of a Roman province (Hispania Ulterior), the capital of an Arab State (Al-Andalus) and a Caliphate. Such splendor is palpable in the intellectual wealth of this city, that has seen the birth of figures like Seneca, Averroes, and Maimonides. The historic quarter of Cordoba is a beautiful network of small streets, alleys, squares and whitewashed courtyards arranged around the Mezquita, which reflects the city's prominent place in the Islamic world during medieval times. Cordoba also has much to offer in terms of art, culture and leisure, thanks to a myriad of cultural events that are organized here throughout the year: Flamenco festivals, concerts, ballet and other activities. These events are complemented by a number of museums and a good nightlife scene. 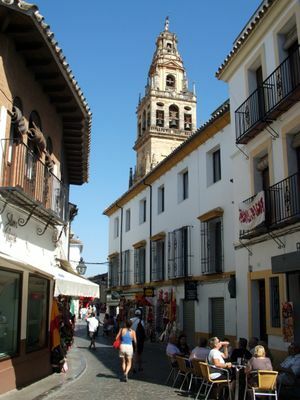 Despite its interior location, Cordoba has a mediterranean climate. Along with neighboring Seville, it is known throughout Europe as having the hottest summers in the continent. In fact, the average high is 1°C (2°F) higher than Seville, at 37°C (99°F), due to being further inland. Despite having relatively pleasant nights (around 20°C (68°F)) many tourists and even locals find the heat during the afternoon unbearable so they choose to stay indoors and the come back out during the evening. Temperatures above 40°C (104°F) are frequent and during heat waves they can occasionally reach 43-44°C (109-111°F). The record high is 46.9°C (116.4°F), reached recently on 13th July 2017. Cordoba on the other hand has cooler winters than Seville, again due to its larger distance from the sea. Nights are cold in fact (around 3-5°C (38-41°F)) but days usually remain around 15°C (60°F). The high humidity keeps temperatures from falling below freezing but the mercury can dip around 0°C (32°F) 3-4 times annually. The record low is -8°C (17°F). Snow is extremely rare and the last occurence was in January 2010. It is commonly said that the best month to visit Cordoba is April when it's neither too hot nor too cold and drier than October (the second best month). Cordoba's modern train station is location in Avenida de America, at the northern end of the central district. To get to the old town and the Mezquita, you can catch a taxi (about 6€) or just walk about 25 minutes (head along Avenida de America and turn right on Avenida del Gran Capitan). AVE , Spain's high-speed rail network, offers very fast and comfortable train service to Cordoba, but it is a bit more expensive compared to regular bus or train services. AVE trains run hourly from Madrid (1 hour 45 minutes), Seville (45 minutes) and Malaga (50 minutes). There are also two daily AVE services to Barcelona (about five hours). Additionally, there is a very cheap sleeping train option from Cordoba to Barcelona (Andalucía Express). As an alternative to the AVE there are also cheaper RENFE trains, such us the Lanzaderas to Seville and Malaga (for around 15-20€) or the Altaria and the Alivia trains going to Granada (2 hours 30 minutes) and Madrid (2 hours 30 minutes). For schedules, prices and tickets, check the Renfe website . Cordoba's bus station is just across the street from the train station. Regular bus service is available from almost every town in Andalucia as well as from Madrid departing from the "Estación Sur" (around 6 buses per day). For bus info try these sites: , . Although Cordoba has an airport, nowadays there are no commercial flights. The closest major airports are in Seville, Málaga and Madrid; from there a train or a bus would take you to main train stations and you can change to other train towards Cordoba (train from Seville around 30 min and from Malaga 50 min). Some travel search engines already calculate schedules and total prices combining flights and transport segments . 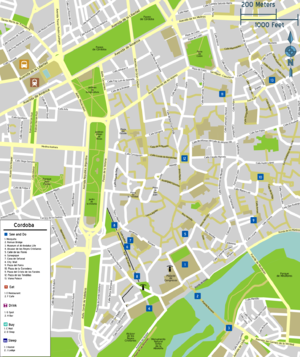 Just about everything of interest in Cordoba is within easy walking distance (the one notable exception being the Medina Azahara), and the typical tourist can do with the standard tourist map which can be obtained from the tourist offices (one on the east side of the Mezquita and the other between the Alcázar and the city walls) or online . One of the many areas with much to see is the Old City surrounding the Mezquita yet there are loads of amazing and unique old neighborhoods everywhere, that's why Córdoba has the second largest Old town in Europe, the largest urban area in the world declared World Heritage by UNESCO. The Old City is a tangle of medieval-style streets roughly bounded by the Guadalquivir River on the south, the area surrounding Plaza de las Tendillas on the north and the tree-lined Paseo de la Victoria on the west. This area is crammed with places to stay, eat and buy souvenirs, though many visitors may find certain areas (particularly immediately surrounding the Mezquita) too touristy, with more interesting things found wandering into the tiny streets of the Jewish Quarter to the west and north of the Mezquita. Behind the Mezquita the Roman Bridge crosses the Guadalquivir River to a museum in the old gate on the opposite side. The area immediately to the north of the Old City, roughly from the area around Plaza de las Tendillas to Avenida de America is a more modern section of town and is where the train and bus station is located as well as a major shopping area. Along Paseo de la Victoria on the west side and Avenida de America on the north are large parks that make for a pleasant stroll. M-Sa 8:30-19:00, Su 8:30-10:30 and 14:00-19:00 (last entry 30 minutes before closing). €10 (free entry for morning mass from 8:30-9:20 only. However, this is for individual tourists only and you will be asked to leave at 9.20h. Groups must pay and can only enter after 10am. Nobody may enter from 9:20-10:00). The biggest attraction in Cordoba and a truly must-see building, the Mezquita is a massive former mosque-turned-cathedral famed for its "forest" of columns topped with Islamic-style red and white striped arches among its other many architectural highlights and serves as a reminder of the glory and importance Cordoba held in medieval times. The building is full of history and beauty - you'll want to give yourself at least a couple of hours to do it justice. 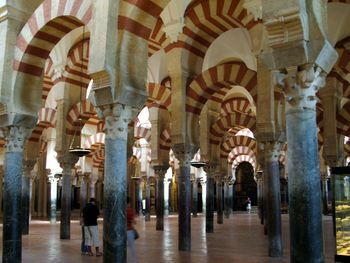 Built in 786 as a mosque, the structure was expanded several times under Cordoba's Muslim rule while still remaining largely true to the original design. Following the Christian Reconquista of Cordoba in 1236, work immediately went underway to convert the building to a church, and four centuries later a cathedral at the center of the building was constructed, though not without controversy as it significantly altered the space. Today, despite the presence of the cathedral, most of the original mosque structure remains remarkably well-preserved. Approaching the Mezquita, the first thing you will notice is the massive bell tower on the building's north side which looms over the surrounding buildings. Built in the 1600s the tower replaced a minaret previously on the site. 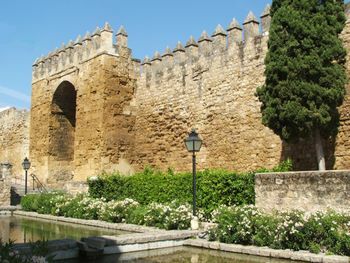 Along the outside of the building the wall takes on the appearance of a fortress, with an elaborate set of Moorish-style archway and windows spaced every so often. Stepping through one of the doors you'll enter the Patio de los Naranjos, or Court of the Oranges, which true to its name contains a grove of orange trees, planted in symmetrical rows that replicate the forest of columns within the building. A large fountain drips pleasantly in the middle, and the views of the bell tower framed by trees are excellent. The Patio is free to enter and is open during the day as a public park - the ticket booths are located on the bell tower side of the courtyard. Entering the interior you'll immediately be standing before the forest of columns which recede into the distance, topped with their dazzling horseshoe arches. The light in the space will play interesting tricks with the arches and varies pretty dramatically as you walk through the building, going from rather dark when you enter to very bright at the cathedral in the middle and back and forth as you continue. Opposite the room from the entrance is the Mihrab, a spectacular archway decorated with Arabic writing which was the focus of the mosque, as it faced in the direction of Mecca and was what every Muslim faced as they knelt on the floor to pray . Once, tens of thousands of people could fit into this space to pray, the multitude knelt on their rugs before the Mihrab. In the corner of the building nearby are glass cases with artifacts excavated from beneath the Mezquita, and the walls along the side of the building are lined with chapels, each one with an intricate piece of artwork. At the center of the building, the Cathedral towers over the rest of the building, and the transition from the impressive-but-intimate mosque structure to the overwhelming awe of the cathedral is abrupt and rather jarring, but don't let that stop you from taking in the beauty of the cathedral, with its rich decoration and well-illuminated interior, standing to suggest triumph over the Muslims who previously used this building. The presence of the cathedral also offers the unique opportunity to so easily compare the differences between Muslim and Christian architecture. A tangle of narrow medieval streets surrounding the Mezquita, the Old City sits just uphill from the muddy Guadalquivir River and contains the vast majority of Cordoba's tourist attractions. North and west of the Mezquita sits the Jewish Quarter, a neighborhood which dates from the late Middle Ages and offers an interesting stroll, some lovely patios and a few scant reminders of the Jewish population that once lived here. Plaza del Potro - A small old square where Don Quijote de la Macha stayed in one of his adventures. You can find there a nice fountain with a small horse and a 'Triunfo de San Rafael'. Julio Romero de Torres local painter Museum and Fine Arts Museum are also located in this place. Plaza de la Corredera - The only 'Plaza Mayor cerrada' (closed main square) in Andalucía. Plaza del Cristo de los Faroles Cuesta del Bailio (Close to Alfaros street). The most impressive square, the best time to go there is the sunset or night (see picture). A Christ in the Cross statue adorned with lot of old lanterns, candles and flowers in a very quiet atmosphere. Viana Palace - former residence of the Marquise of Viana, is an impressive museum featuring furniture, tapestries, porcelain, tiles, paintings, leatherwork, muskets, a 7000-volume library and extensive gardens spread out over 14 patios. May - ¡Mayo!. The best time to visit the city. 'The Month of Córdoba'. Semana Santa (The Week Before Easter) - Processions throughout town involving scenes from the life of Christ, bands, and penitents. Very nice exhibition of the city's culture. Approximately six processions each night from 6 p.m. to midnight. Festival Internacional de la Guitarra  - The city become the world Guitar Capital during two weeks full of concerts featuring the top world guitar players and bands ranging from Jazz/Blues, Classical, and of course, Flamenco. Excellent music and dance seminars, music courses, and conferences about guitar. Carnaval A typical Andalusian carnival (not as huge as Cadiz's festival, but a great time neverthless). The city center is full of people in costumes during the weekend, funny songs are sang throughout city squares. Hammam - Arabic baths  - Just 5 minutes walking distance west of the mosque there is a modern Arabic bath that recreates the ones used during the Moorish era. During the golden times of the western caliphate Cordoba was said to have more than 400 hundreds baths. The site offers a session of two hours (including a massage). Drive an electric car  to discover one of the largest historical downtowns in Europe. The electric car is equipped with a GPS touristic assistant which gives audio tours on the monuments within 100 meter. Descriptions available in Spanish, English, and French. Besides, there are 10 exclusive parking spots to park the electric car. From 14.5€ per hour 2 seats and 4 seats cars available. Take a Segway Tour  in Cordoba, passing by places which are normally missed by the visitor. English spoken tours. From 15€ per person. Sukia - cocktail shop, Cuesta Luján 4. (between Plaza de las Tendillas and San Fernado), 95749051, Really cool shop. Its sells Kitch, be it in clothes, music, decorations form, if its Kitch from the 50's 60's or 70's its here. Blas s - Artisanal Ceramics, Calle Martinez Rücker. (The street leading to the Mezquita with a Moroccan restaurant.) This store is one of Córdoba's hidden gems. The owners sell beautiful ceramics of various different styles from their patio, so not only do you get to take a look at lovely handmade ceramics, but you also get a feel for the traditional Cordoba patio. If you're not lucky enough to visit Cordoba during the weeks of the patio competition, this store offers you a great opportunity. The ceramics are also of a higher quality than those of most of the stores around the Mezquita, since the store is dedicated to ceramics and isn't tourist-oriented. They are currently displaying the works of Carlos Durán, a Toledo surrealist with a flare for color. One of the traditional craftwork in Cordoba is jewellery. Good value jewels, specially gold, can be found around the city. However, it is advisable to buy far from touristic sites as they are the most expensive places to buy that. One place to check it is around Jesus Rescatado avenue. Casa Rubio Located in the heart of the Juderia, this place offers decent tapas for the price. A bit more expensive version of it is next to the mosque, called Casa Pepe de la Juderia, which serves the same food at a slight markup for location. Excellent bravas. Worth checking out. Caballo Rojo Located around the mosque, locals claim it has the best "rabo de toro" in town. Bodegas Campos, Los Lineros, 32 San Pedro, 14002 Cordoba . Open traditional Spanish hours. Classic Cordoba place to eat. Historical building and famous for people who have visited. Food is fantastic, very recommended! Casa Mazal, Tomás Conde, 3, 14004 Cordoba . This restaurant, situated between the mosque-cathedral and the synagogue, offers customers a chance to sample traditional Sephardic Jewish cuisine. Kosher guests will be pleased to note that, although the meat is not kosher certified, none of the dishes mix meat and dairy. The restaurant is run by a Sephardic family. The food is, truly, divine. Castillo de la Albaida A refurbish Castle settled in the Córdoba sierra's slope, 10 minutes from city center by car. Very good Cordoban food with splendid city sights. El Churrasco Romero 16, 14003 Cordoba +34-957 290 819. With amazing meat dishes and much more. Very close to the Mezquita. Taberna San Miguel "El Pisto" Plaza San Miguel, 1, Cordoba, 14002. Great place to try some typical Tapas. The best 'Pisto' in the world! La Gusa, C/ Diario de Córdoba, 18 (Near ruins of the Roman temple), 957491123 ([email protected]), . Every Day 2PM-1AM. A refreshing twist on traditional Spanish cooking. Relaxed cool atmosphere and unusual flavours. Amore Bona Pasta, C/ Reyes Catolicos, 17, 14001 Cordoba, +34 957484848 . Fantastic pizza and pasta at $-$$ prices. Try the Pasta Carbonara, very nice. Pizza was great as well. La Fragua Cja. Los Arcos, 2 (off C/Tomás Conde) Phone: (+34) 957 48 45 72. Delicious home made food and traditional cooking with a modern and personal style. Enjoyable meals in an authentic 16th century charming courtyard accompanied by flamenco ambient music. It is also possible to try tapas and drinks for a very reasonable price. Relaxed atmosphere. Taberna La Lechuga C/Tomás Conde, 12 +34 204 311. Cordoban Traditional style food. Try their brand name tasty specialty, seasoned "lettuce sprouts", served with garlic. They serve a wide range of traditional dishes. Don't forget their "Croquetas", but to be sure about their daily recommendations just try and ask their friendly staff. El Mercado Victoria is a fashionable place in the centre of Victoria Avenue, which is the same as the San Miguel Market in Madrid. Here you can find a variety of types of food from sushi to Mexican. During the night it turns into a disco. Whilst a little expensive, it is definitely worth it, as the atmosphere is very comfortable and exciting; perfect for younger people. Sojo (pronounced Soho) is a fashionable bar which is situated by the Guadalquivir River. Here you can find an enermous disco-bar with different rooms where you can have a coffee enjoying the wonderful views of the river or drink to the latest hits. The decoration is a blend of a modern style with Arabian features to incorporate the Cordobian culture. El Arriate a very cute and friendly cafe/bar on the top of Calle Alfonso XIII, just off of the main square. The atmosphere is very warm and welcoming with an intimate feel and the barstaff are always happy to help you out, give you information and teach you some Spanish! Theres good wifi, good coffee and English speaking staff. Plaza de la Corredera Plaza de la Corredera. A lot of bars in this beautiful place, nice enviroment and nice people. Vial Norte (Paseo de Córdoba) Paseo de Córdoba (aka Vial Norte). A lot of modern bars in the newest part of the city. Cute people and fancy pubs. El Brillante, el Tablero Avenida del Brillante. For summertime, fancy bars, fancy people in those rich neighborhoods. From June to September. Ciudad Jardín neighborhood Alderetes street, Julio Pellicer street. A lot of small but very fun places to dance, drink....to have fun! From October to May. Owing to strong Arab influence in the city, it is possible to find some teashops in Cordoba, for example, a magnificent one in the heart of the Jewish Quarter, and other places, which are not specialised in tea, but still serve tea of high quality. For example, the Salón del Te (calle Buen Pastor, 13) is a typical house with a baroque decoration adapted to the Andalusian world, which offers an extensive list of teas. Drinking tea in this teashop can be made more enjoyable with a spectacle of Oriental music and dance for no more than 8€. In Luna de Cristal, a teashop (Plaza de la Cañas, behind the Corredera), you can try some rich beverages exclusive to Arabic Cordoba, with Andalusian flavours and aromas. This teashop is also a typical Andalusian house with an apartment service (Apartotel), which has five decorated rooms with Moorish names. Drinking tea is becoming more and more habitual in Cordoba, although people of Cordoba prefer to drink beer or wine of Montilla Moriles. Hotel Maciá Alfaros, . Great hotel with old town central location. Walking distance to central plaza, shopping, archeology sites, drinks. Reasonable rates, excellent for business travel. Hotel AC Córdoba Excellent hotel in a modern environment set a block from the bus and train stations, very close to the city center. Hotel Córdoba Center The newest hotel in the city, 5 minutes walking distance from Train/Bus station and city center. Hotel Hospes Palacio del Bailío, the first and only 5 star hotel in town. Centrally located. Recently inaugurated. Incredible old city palace from the 16th Century. Respecting both Roman and Moorish architectural influences. 53 rooms, restaurant and Spa. The new essence of Hospes Palacio del Bailío tells an old story, its architecture speaks of history in the old quarter of the city, next to the Cristo de ls Faroles square and 10 minutes from the Mosque. Hotel NH Amistad  Plaza de Maimónides, 3, 14004, E-mail: [email protected] Tel: +34 95 7420335 Fax: +34 95 7420365. In the heart of the old town, 5 minutes walking from the Mezquita. Settled in the old city walls, inside a beautiful palace. There is another NH hotel right next door- the NH Califa . Hotel Itaca Cordoba  Alhakén II, 4, 14008 Tel: (+34) 957 470 017 E-mail: [email protected] .Located in Cordoba center, just 500 meters from Plaza de Colón. It offers spacious, modern rooms with private bathrooms. Wi-Fi is available throughout the hotel. Apartamentos Mezquita Economical solution is to rent an apartment with a kitchen save on breakfast, lunch and dinner, and being at home. Apartments Mosque is nice, new and clean, seats 8 people and a great location beside the mosque. Exercise caution when walking around the area near the Mezquita: beggers will try to sucker you for some money and they often work in teams. You may find yourself being charged 40 Euro for a palm reading, or having your money snatched by a little kid working together with the supposed palm reader. Just keep an eye on your things and don't get caught up with their scams. Bujalance. It is worth a day visit if you want to see a typical Andalusian baroque town with Arabic influence surrounded by olive fields. Regular buses leave from Cordoba Bus Station every hour or so and take around 40 minutes to the town (La Sepulvedana Bus, around 7€ return ticket). Bujalance bus stop is 10 minutes walking distance from the old town centre, the tourism information office and local museum are located at "Calle veintiocho de febrero, 4", near the main church and the castle. Must see: the Muslim castle and narrow streets surrounding, the Cathedral and its impressive leaning tower, the chapel of Jesus Nazareno surrounded by olive fields and the baroque buildings and palaces (e.g. Hospital de San Juan de Dios), all monuments are free. For eating, most locals would recommend Restaurante El Tomate, in C/Rector Viejo (lunch set menu of tasty local food “menu del día” for less than 10€). For sleeping, Hopedería La Querencia, in Plaza Mayor, which offers excellent value for price. In Cordoba province are other beautiful villages like Priego de Córdoba, an example of Spanish baroque; Zuheros, the typical white Andalusian village with an impressive castle built on a rock; and Montilla, hometown of Montilla-Moriles wine. Parque Nacional de la Sierra de Hornachuelos in Hornachuelos and Parque Natural de las Sierras Subbéticas in Cardeña are interesting nature reserves. This page was last edited on 14 January 2019, at 12:07.